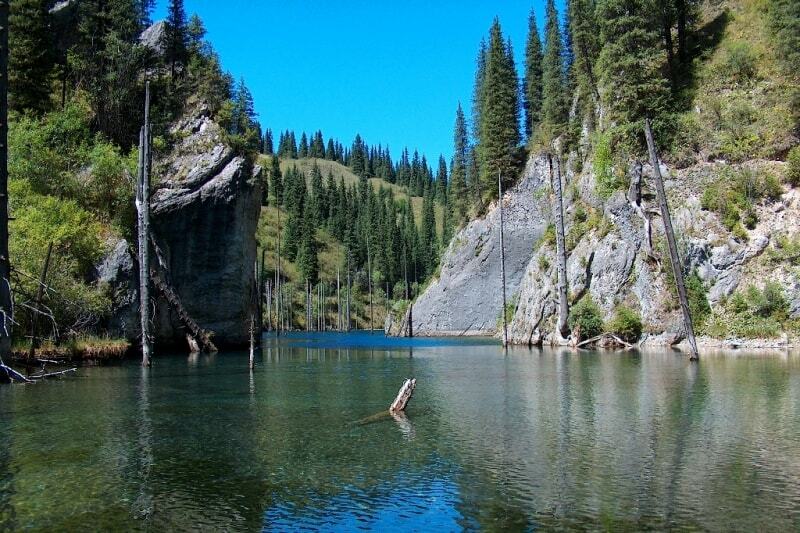 Exclusive tours Kolsay lakes Kazakhstan. 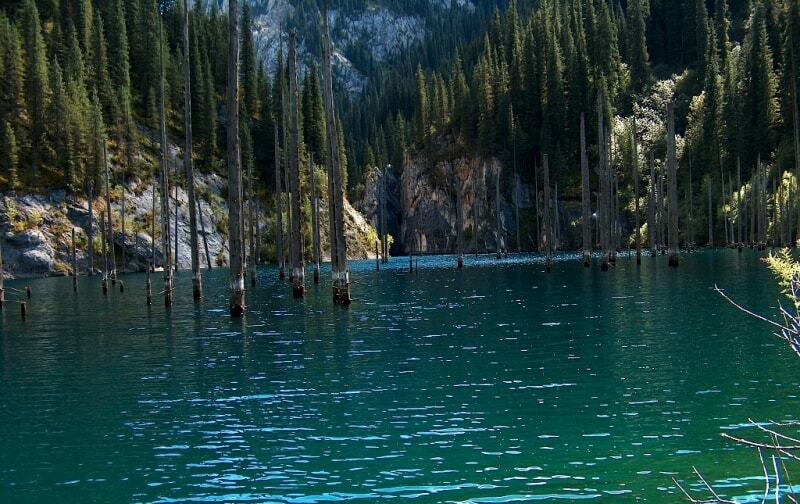 Kaiyndy is a beautiful lake(“Birch Lake”: translation from Kazakh), which is situated in the northern spurs of the eastern part of Kungei Ala-Tau and it is 1867m above sea level. May be it was a result of a big landslide or crumbling which partitioned off Kaindy river. 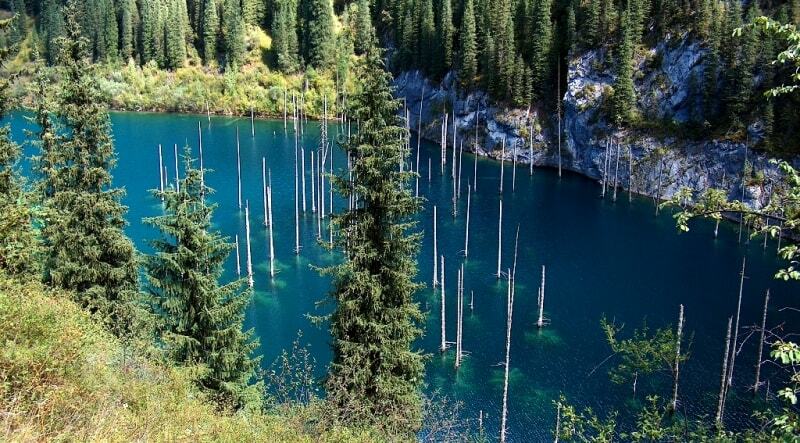 As the orientation to find this lake can be the famous Kolsai lakes in Kazakhstan, which are situated through tow ridges from Kaiyndy. 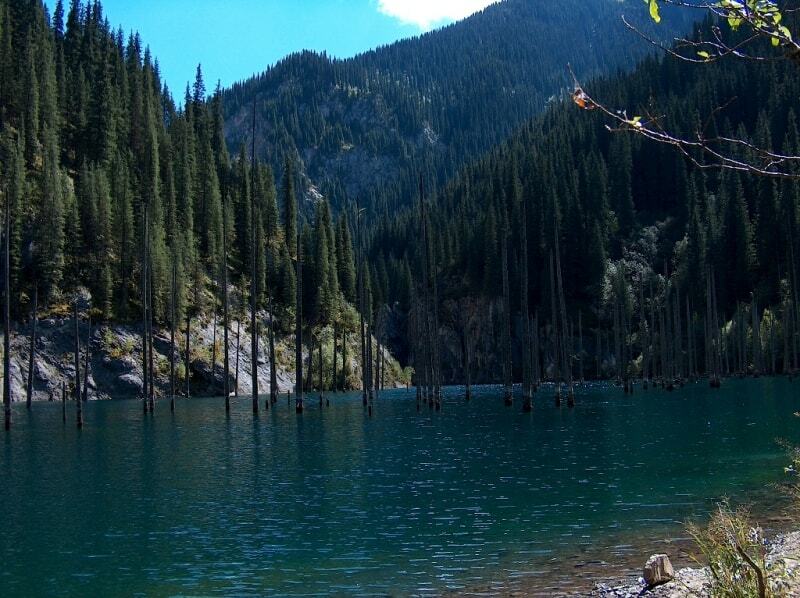 If Almaty is the place of your departure you will head for the settlement Saty. Kaiyndy is in 320km from the center of the city. 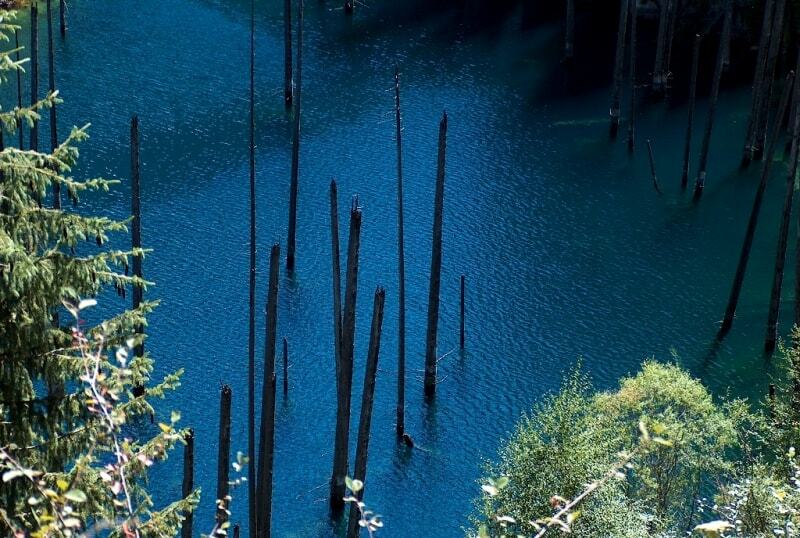 It is strange, but tdiis uncommonly beautiful lake is almost unknown. Probably, the nearby Kolsay Lakes distract tourists attention. And never-theless, the Kaindy Lake gradually increases in popularity every year. The Kaindy Lake is very young, geo-logically. It was formed only last cen-tury, as a result of a land subsidence. 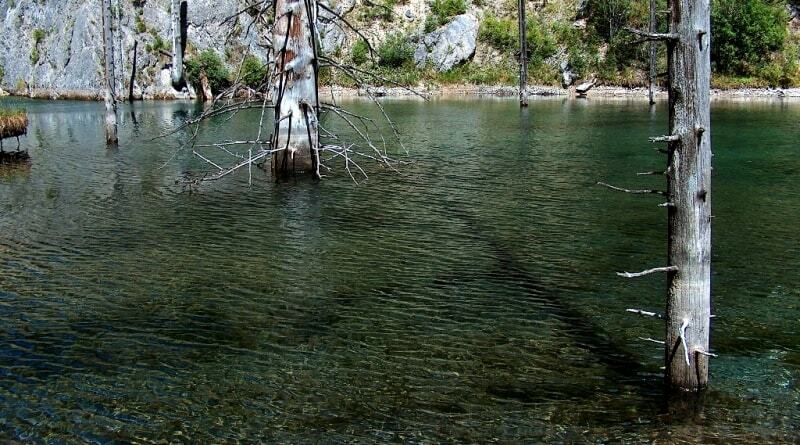 Water flooded the resulting basin, forming a natural rocky gate in the middle of the lake. 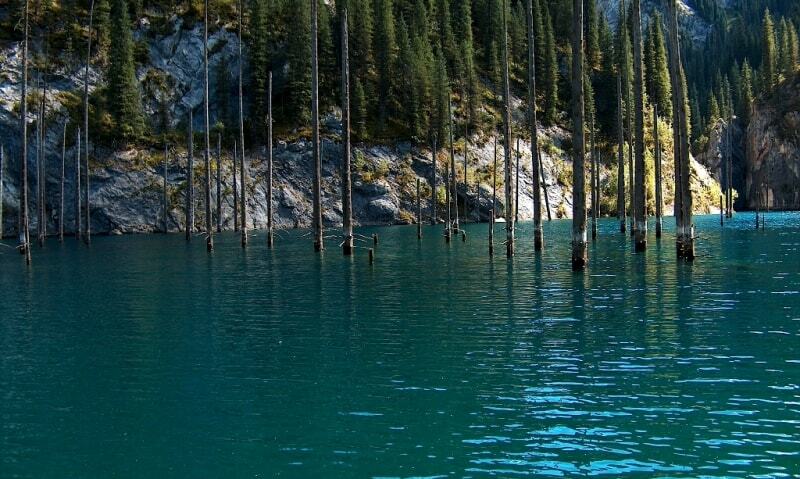 The flooded fir-trees rave not yet decayed, and their dry tops rise above the cold water. If you have swum far away from shore, you have an opportunity to climb one of drowned firs and warm-up in the sun. 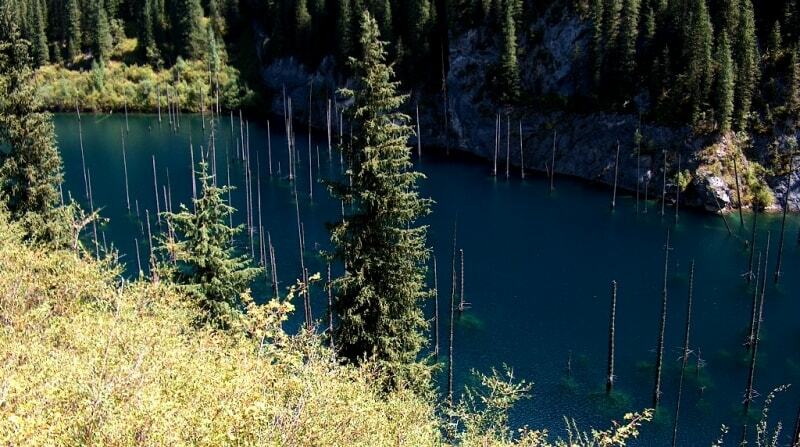 This lake is located in the canyon to the east of the Kolsay Lakes. It is necessary to drive up to Zhalanash, the Regional Centre, to the east of Almaty (turn to the right from the Narynkol highway before the Charyn River). Then head from Zhalanash up to the Saty settlement in the west. 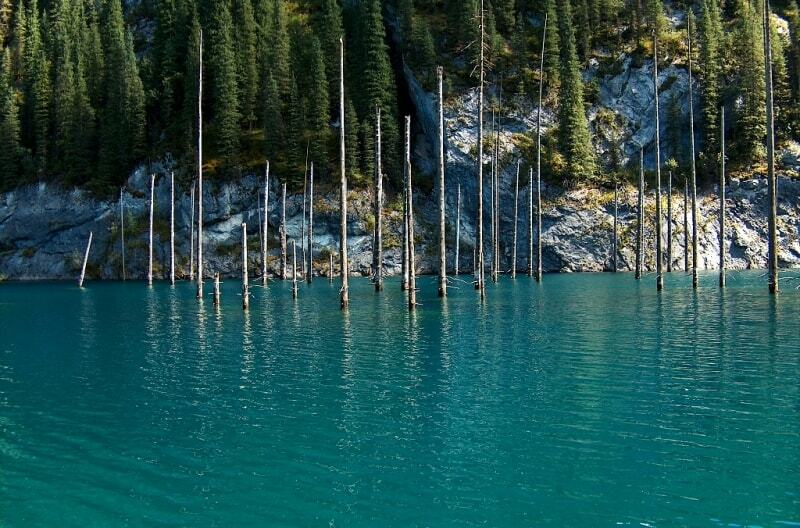 This settlement is located 320 km from Almaty. It is necessary to urn to the left on the dirt road one kilometre before it, by a cemetery. This road brings you up to the lake, but only vehicles with greater power can make it. The lake is located in timber country. There is a barrier near a forester's house. Entry fees are 600 tenge per the machine and 600 tenge for each person. Arrangements for many days tours on Kaindy Lake are possible, the programs of which include the Scythian baths on the lake shore. 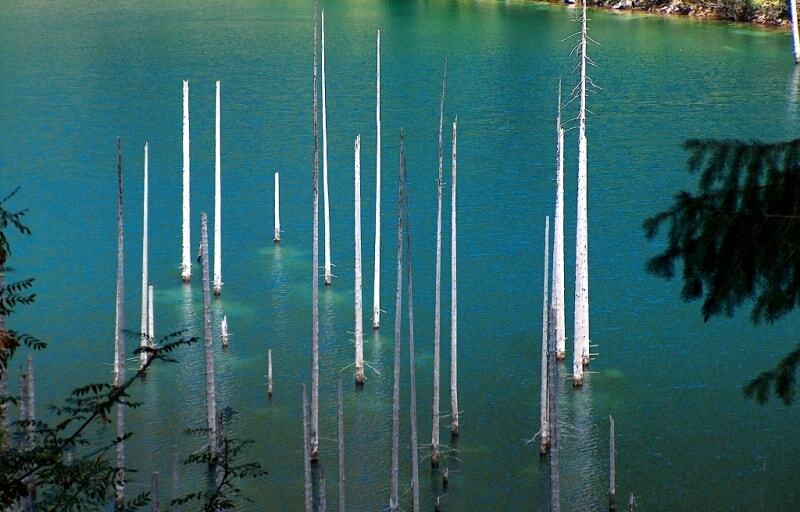 The lake was created about 100 years ago as the result of an enormous limestone landslide. 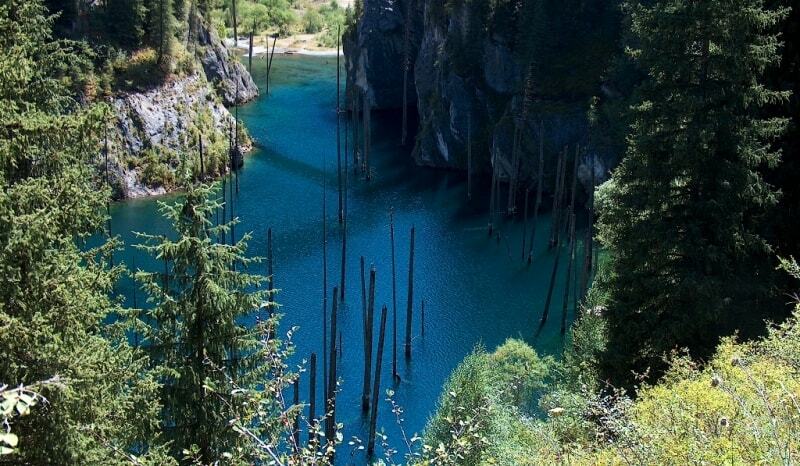 The embankment partitioned the gorge with а natural dam. 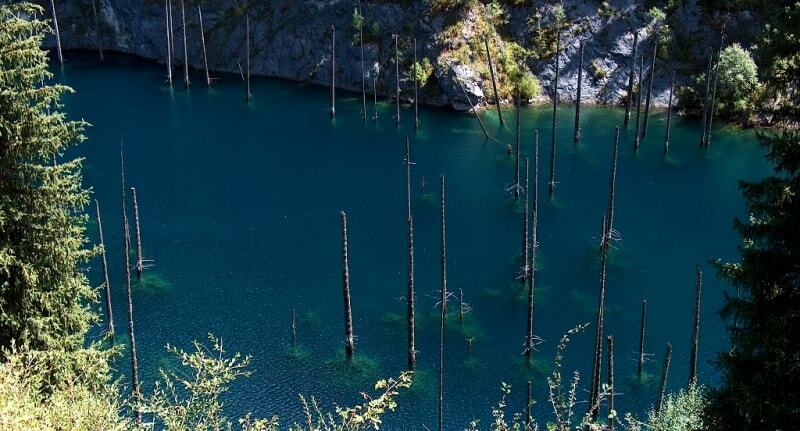 The 400-m-long lake is almost 30 m deep. There are fine views over the Saty Gorge, the Chilik river valley and the Kaindy gorge. 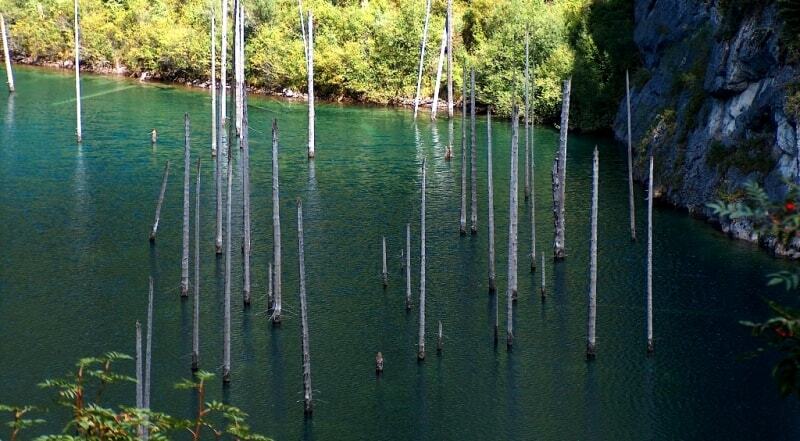 The dried-out trunks of submerged fir-trees rise above the surface of the water like the masts of а sunken ship. 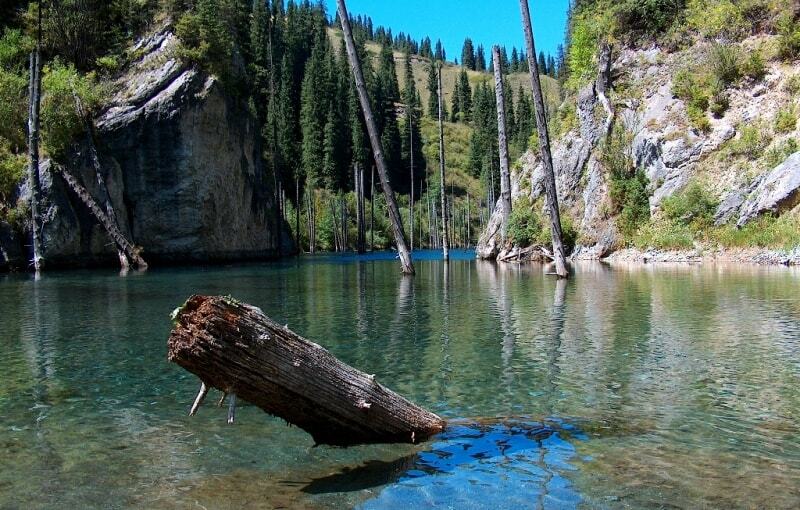 "Zhetysu is the Land of tourism”. A Tourist Guide-book. Almaty. 2003. 68 p. and the material for this page is taken from the printed edition. "Guide to Kazakhstan" Baur Publishing House 2002. From the advertising guidebook across Kazakhstan. The ministry of tourism of Kazakhstan.